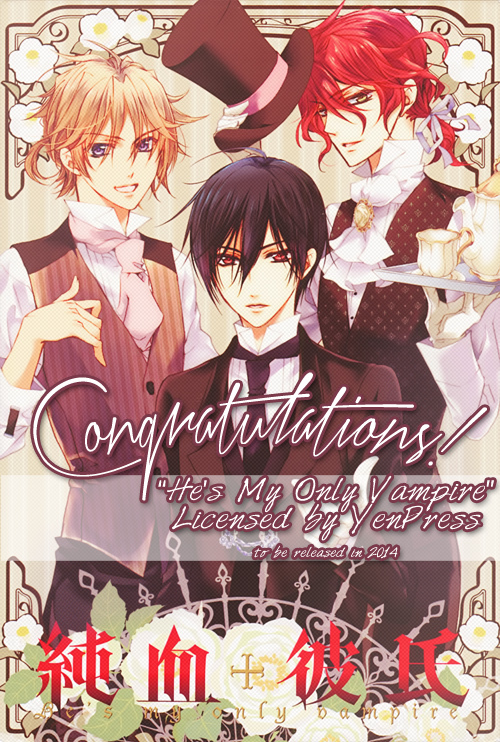 Congratulations to Yen Press for Licensing Junketsu Kareshi (hereafter He’s My Only Vampire”) for English Release! How exciting is that? Now, since it’s being licensed for English release and I have approximately ZERO interest in competing with the English market, Turtle Paradise will be dropping the series effective immediately. (Boy… Now I don’t feel so bad for not getting started on volume 5! WHAT A CLIFFHANGER THAT WOULD HAVE BEEN.) We’ll be removing our downloads very shortly here as well. In the meantime, thank you all for the support in the very short (lol) tenure since we took over. Now get your wallets ready, and get to preordering! Now that we have that out of the way, it’s release day! Just one for now, but hey, one is better than none, right? That’s it. That image is the chapter. Tenjoh does things, Anis gets ROYALLY pissed– well, given where the last chapter left off, is that really any surprise? Here’s where the big reveal comes in, but it’s not until the next chapter (THE END ;_;) where we find out exactly how broken Tenjoh really is. BARAJOU, YOU WILL ALWAYS BE MY ONE TRUE LOVE. (Maybe Melly and I will take a picture of all of our swag to commemorate the final release, lol) THAT SAID, this chapter! Was edited by Egotist, typeset and translated by yours truly, scanned by Melfra, and QC’d both by Melfra and newcomer ToxicStream! Enjoy! To close us off, here’s where I introduce our new staff! Please welcome ToxicStream, our newest (and coolest! SORRY MEL) QC, and JV, who just took (and passed!) the typesetting test last night. So now we’ve got two QCs, two typesetters, and… NO EDITORS? Yes, that’s right! We’re still in dire need of editors for our latest and greatest series (many of which we haven’t even announced! ), including the last chapter of Barajou… So if you’ve got the time and feel up to helping out, please drop by the forum and take the editing test. 6 Comments on "Hello, and Goodbye!"